In a time where going to the cinema is equivalent to covering your ears to avoid going deaf, Argentinian composer Sebastian Pecznik’s music feels like a relaxing aural massage from your favourite audiophile spa. Not overblown just for the sake of it but rather very intimate and close to the heart, his scores always involve as many live musicians as possible to really help bring his notes to life. However, this doesn’t mean that Sebastian Pecznik only works with the biggest budgets imaginable. It only shows that his scoring always focuses on capturing the core human element of the projects he is working on. Over the past year, I have been opportune to meet up with Sebastian Pecznik several times in Berlin and today, I’d like to shine a light on his creative process. Sebastian Pecznik in his studio in Berlin. I met Sebastian for the first time in August 2016 during last year’s Soundtrack_Cologne. He had only been living in Europe for a few months. With a thriving career in his home country, he had decided that it was time for a new step; he obtained letters of merit from the Argentinian Chancery and the General Bureau of Cultural Affairs, and then he jumped into the cold spring water of the German capital at the river Spree. With his background as a classical guitar player, music producer of various styles, orchestrator, arranger, and composer, he was very well prepared – and yet, when he told me at the end of 2016 that he had received the “best soundtrack award” at the local Berlin Brandenburg Landes Film Festival I could sense how much that meant to him after the big risk he had taken by crossing the pond. 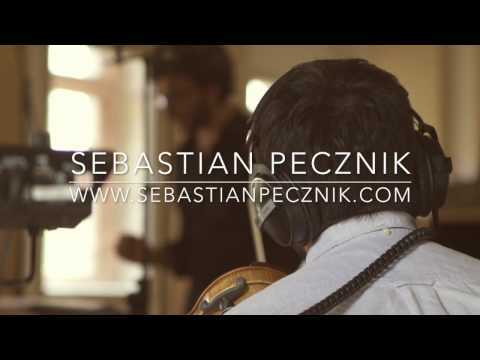 When you meet Sebastian Pecznik, his passion for the arts and musical craft immediately becomes apparent as soon as he starts to speak about his views on various creative approaches to film scoring. While he always immerses himself and expends basically all of his energy on his projects (and would barely be considered alive by the end of them), three things are always paramount to Sebastian: achieving his clients’ vision no matter the circumstance, honing his craft whenever possible, and challenging his performing musicians while keeping them excited about their involvement on a project. The longer you speak with Sebastian Pecznik, the more often you will hear “I love what I do.” Him feeling grateful to work day in day out in the field of music becomes obvious by the infectious amount of energy that he transfers onto the people around him. If he gets an idea, come what may, he will definitely try it out and find a way to pull you on board; sometimes in English, sometimes in German, Spanish, Italian, or French. Sebastian Pecznik in his favourite environment: Working with live musicians. At the moment, Sebastian collaborates again with Swedish composer Jimmy Lagnefors but cannot say too much about it yet. Thus, to end our little journey into Sebastian Pecznik’s world, please have a listen to another of his upcoming scores: The quirky yet sincere documentary Operation Liberland thematizes a curious story that itself needs to be told in a different article at some point in the future. Until then, make sure to follow Sebastian Pecznik via his website, Facebook, Twitter, or Instagram.